Buyers can now receive immediate information on their smart phone, 24 hours a day 7 days a week (talk to no real estate sales representative). Getting information on homes is often a lot of hassle. 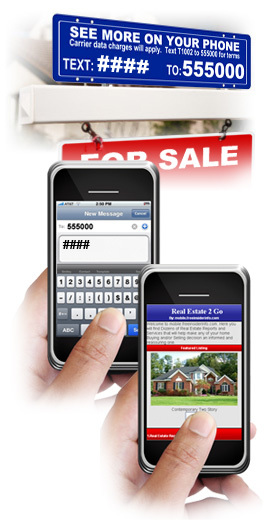 Either you have to chase down the real estate sales representative, or spend hours online searching for the property. This is great for everyone involved. First of all, our experience shows that when homebuyers don't have to dodge an real estate sales representative, many more of them will call in for information on homes. And it's really easy and convenient for buyers too. You can send a text message anytime, day or night, and never have to speak directly with an real estate sales representative (unless of course you want to).